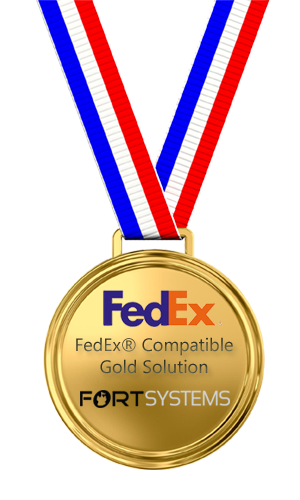 FORT Systems is one of a handful of Gold Level Compatible Solutions Providers in the country. In addition, FORT is recognized as one of six Marketplace Integrators. FORT is deeply integrated with FedEx at several levels, and keeps all APIs and procedures up to date to ensure maximum efficiency and seamless productivity for you. The FedEx Compatible program allows providers of e-commerce solutions (Shopping Cart, Marketplace Integrator, Order Management, Enterprise Resource Planning, Transportation Management and Warehouse Management) to integrate core FedEx functionality directly into their solution. This allows users simple, streamlined access to the shipping and delivery solutions they need. The FedEx Compatible Program seeks to develop win-win relationships with third-party software providers to enable their systems with FedEx shipping functionality and to provide industry leading technical support as well as marketing programs to create a competitive advantage. As a result, the program makes it more efficient and more convenient for customers to ship via FedEx because the FedEx shipping functionality is integrated into the shipper's business systems, making FedEx shipping a seamless part of the shipper's end-to-end process flow.